Built in June 2017, this tri-level home completely captures the true essence of living the luxurious Florida lifestyle. No expense was spared to create this luxurious haven of elegance, with a heated beach-style entry access pool with picturesque water features including a spillover waterfall and heated spa surrounded by a lush tropical backdrop. Perfect for a family of 12, this home boasts two masters (king size bed in each), three queens and two twins in the guest rooms. For your convenience, we also include a plush and comfortable airbed that sleeps 2. This open and spacious floorplan easily and comfortably sleeps 12, providing ample room to sprawl out and create your own space to retreat or to mingle together for movie time, barbeques, and pool fun! The living room is open to the kitchen, making family time easy to enjoy. And don't forget to open the doors to the exterior lanai and pool area while you cook a scrumptous and wholesome meal for 12 using both the interior and exterior kitchens. Tall ceilings in the common area guide your eyes up to the loft overlook where children can spend time in their very own playroom. Close the doors to the playroom for more privacy between family members, or leave it open to invite hearty laughter and conversations between everyone. It's your choice and your vacation.... every day can be a little different experience, and this home can offer so many exciting things to do. Whether you are someone looking to replenish your spirit with a little quiet relaxation, or you are excited about the adventures to be had- everything from water sports, beach bumming, or sight seeing abound in our perfect paradise- Sea Grape Cottage is the beginning to a perfect stay for you and your family and friends. Siesta Key is a small magical Island lying just off the coast of the City of Sarasota that can boast having the Number One beach in the entire United States as well as placing in the top five beaches in the entire world! And it is so popular with vacationing families! Just after you cross the North Bridge from the mainland in the coveted northern part of the Island, among some of Siesta’s wealthiest homes, lies the luxurious "Sea Grape Cottage." You have arrived to your destination in paradise and this home will set the foundation for one of the best vacations you will every experience. Every amenity is at your fingertips, from the pool and spa, and the outdoor kitchen that boasts the best ways to enjoy your getaway. There's no better way to explore our exquisite key and the city of Sarasota than to stay at such a centralized location. Moments from Siesta Key Public Beach Access, and just a few minutes from the heart of downtown Sarasota... Welcome to Sea Grape Cottage! Please note this property can only be rented for a minimum of 7 nights, 8 days. This unique and one of kind vacation home exudes beauty, profoundness, and intelligence... which is what makes it so very special. If you have stumbled across Isla Amor, and it has availability, aspire to truly capture this moment on Siesta Key with everything you have. The experience is worth every cent. Isla Amor features a gorgeous and tranquil poolside setting, with comfort and relaxation in mind. There is a dock on the canal with room to fish or even just sit on the quaint bench while watching fish jump, birds dive and hunt, and boaters passing by with friendly smiles. 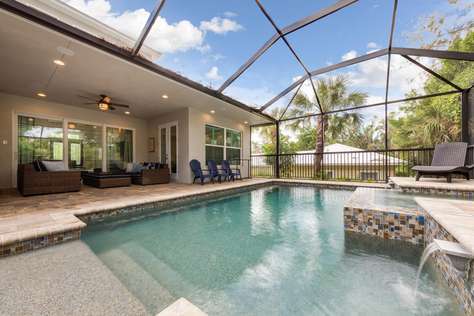 Lounge poolside day or night while enjoying basking in the warm Florida sun. Grilling will bring the family together for large feasts and you can take advantage of our always perfect weather by using the large dining room table outside under the screened in lanai. The amenities for the poolside seem endless to include a separate half bath and exterior kitchen area, perfect for entertaining. Inside, the common area is sprawling and roomy, with lots of seating for everyone. The chef in the family will truly enjoy the open floorplan overlooking the pool area, making it a great place to host dinner parties and watch the game on the super large living room HDTV! The kitchen is first class with beautiful and plentiful cabinetry, stainless steel state-of-the-art appliances and quartz counters. Lavish is the way it makes you feel when you are cooking for 11! Just off to the right of the living room, you will find the downstairs master bedroom with a private bathroom tucked neatly behind a barn-door style enclosure. Welcome to a heavenly spa style retreat as you enter the master bathroom and experience the exquisite clean lines that await you. A bubble bath is definitely what the doctor ordered to soothe your body and soul. Just upstairs, there are four more bedrooms that feature 2 more kings, 2 twins, and one room that features 3 twins... the perfect kid's room! There is a jack-and-jill bathroom between two guest rooms with a privacy door between the toilet/shower area and the vanity to make it easier to share the space while getting ready in the mornings or evenings. Another full hallway bathroom features a walk-in shower. This home comfortable sleeps 11 adults and children. Now that you have explored Isla Amor, it's time to get out there and learn all that you can regarding our beautiful vibrant island! Siesta Key Village is approximately .5 mile north on Canal Rd. A leisure walk will get you there in 15 minutes. There will be 4 bicycles for your use as well as a couple of kayaks! There's no better way to see the entire island than to bike around town, and to explore all of the canals and waterways in the neighborhoods of Siesta Key. Just drop a kayak in and go! The experience is peaceful and yet exciting all at once! There are of course plenty of restaurants, shops and night spots. We highly recommend exploring both the north and south village of Siesta Key (Siesta Village and Crescent Village.) We also have some great day trip ideas that we love to share with our guests, so do not be afraid to call us and we can teach you more about Siesta Key! We welcome you, and we hope you fall in love with Isla Amor and this beautiful island! This spectacular bright cheerful, canal front cottage with a heated pool & spa has 5 bedrooms and 3 baths and it can sleep a total of 13. As you enter Pura Vida Oasis, you will notice an eclectic wine storage rack and desk area awaiting on your right and a lovely dining area with seating for the entire family just across the room on your left. Immediately you will notice two beautiful columns and raised ceilings that reflect the openness of the common area to the living room and kitchen. Beautiful clean tile floors abound everywhere. Directly across the open entry and dining area, and past the columns, you find yourself looking into a cheerful and spacious living area filled with comfortable plush leather seating for all, a huge wall mounted flat panel TV. The background is a gorgeous bank of glass windows overlooking your real prize, an enormous fun-filled outdoor area ready to be discovered and enjoyed! But inside, a newly built east wing of the home has its own separate living room as well as a tiled full bathroom adjoining and accessing the pool area for your convenience. A fabulous dining table that seats eight but can still squeeze a few more in quietly awaits tonight’s dinner group as well as the day’s stories of everything wonderful that happened earlier as children’s smiles and laughter fill the room. Enjoy an updated kitchen with granite counters, bar seating for 3 and a breakfast nook that seats 6 more. Bountiful kitchen appliances, and supplies makes it so easy to cook for a large group! Wall mounted TV’s and Wireless internet are found in every bedroom. Across the grand room you’ll soon discover a large master bedroom filled again with a bank of bay windows overlooking the canal along with a huge comfy King size bed and lovely plush new linens. Adjoining the master bedroom is a beautiful, almost excessive bath featuring a full tile walk in shower with solid glass enclosures, granite counter tops, tile floors…the absolute finest. Closet space is abundant everywhere, as are plants and great art work. Two other bedrooms, first a second master with a queen bed and everything required to truly enjoy the room including a HD flat panel TV. The third bedroom offers a unique twin bunk over a full size bed in a colorful decor for the younger set or a couple with a small child, all with plenty of closet space and furnishings. Both of these bedrooms share another lovely, full tile bathroom. Then meander past the kitchen again to enter the east wing of the house, with a galley that opens up into a 2 bedroom / 1 bath suite with its own recreational space. All sliders and doors from every part of the house open up to the pool and paver area, making this cottage a wide open and extremely comfortable and plush living space. As such, everything is beautifully furnished and organized to maximize your comfort and enjoyment with sleeping up to 13 people in 5 bedrooms. Once you take a moment to step outside, you will see a lovely endless series of paver decks abutting a heated, lagoon style pool with a special sun shelf, and hot spa. To the left you see a fishing dock, kayak launch, 3 kayaks, and more beautiful waterfront. You can also tie your boat up to the dock or arrange a pontoon boat rental from “The Black Pearl” (exclusive to our guests only!) for a portion of the week. We’ll be happy to assist. There is a myriad of expansive paved decks, all enhanced by lush, tropical plantings everywhere and very special landscape uplighting to make the evenings absolutely tantalizing. Truly magical moments await your family’s pleasure at this spectacular retreat. 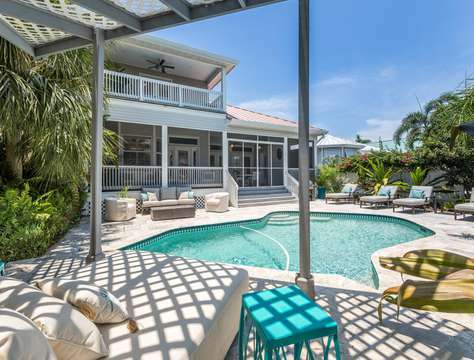 You’ll love this rare tropical retreat with all its amenities and you will truly find it remains incomparable to everything in Siesta Key. It has everything you could possibly desire for a fantastic vacation experience: great location on the water near the Village and beaches, unbelievable heated pool and spa, bikes, kayaks, fishing dock, beach equipment…everything you could dream for and more. Siesta Key Village is just one block away, a leisure walk will get you there in 2 minutes. Plenty of restaurants, shops and night spots. Florida is known for its beaches, climate and foliage so this home features on its grounds an amazing amount of lavish tropical foliage to include many flower species as well as many fruit tree varieties. If you like plants and nature, you’ll love the grounds [almost like a botanical garden]. PLEASE NOTE: There is a 1 rental per 30 day period, per SRQ ordinance. This idyllic 5 bedroom/4 bathroom home is just a short walk to Siesta Key Village and 2 blocks from Siesta Key Beach, voted # 1 beach in the USA! This home is perfect for family get togethers and romantic getaways alike.